Animates the value of a Rect Variable using an Animation Curve. The Rect Variable to animate. Curve to use for the X Value. Calculation lets you set a type of curve deformation that will be applied to rectVariable.x. Curve to use for the Y Value. Calculation lets you set a type of curve deformation that will be applied to rectVariable.y. Curve to use for the Width Value. 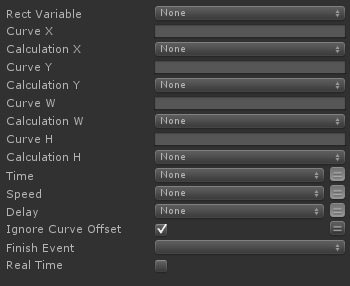 Calculation lets you set a type of curve deformation that will be applied to rectVariable.width. Curve to use for the Height Value. Calculation lets you set a type of curve deformation that will be applied to rectVariable.height.